Music always makes life a whole lot more bearable, and it can prove to be the catalyst during moments when our lives are challenging and difficult. However, with so many different ways and avenues for us to enjoy our music, going wireless happens to be one of the main methods where one’s music consumption does not get hindered in any way at all. 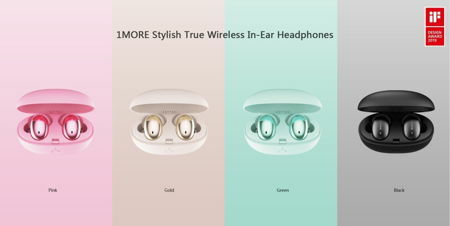 1MORE has come up with their stylish true wireless in-ear headphones which will surely turn heads while delivering excellent audio quality. Sporting an exquisite appearance on the outside, the beautiful design and tamed colors will ensure that this pair of wireless in-ear headphones fit well into everyday lifestyles. It relies on a NCVM (non-conductive vacuum metallization) method, which is an eco-friendly vacuum plated coating process that enables it to achieve not only a sleek metallic finish but also stable signal transmission simultaneously. Armed with a titanium composite diaphragm that has been tuned by Luca, a four-time Grammy award-winning sound engineer from Italy, you can be sure that all of your tunes will sound as close as possible to the original as intended. The 7mm dynamic driver will help balance out powerful bass and exquisite detail, while producing crystal clear sound, all crammed within an ultra-compact design that oozes with enhanced efficiency. As with any other wireless devices, the major bugbear would be the battery life: just how long can the 1MORE stylish true wireless in-ear headphones last on a full charge? 1MORE touts up to 6.5 hours of battery life, and the listening experience can be further extended by up to 24 hours courtesy of the accompanied charging battery box that also doubles up as a safe, sleek-looking carry case. The headphones are compact in nature and easy to hold in your hand, and boast of 45° oblique-angled nozzles which will lay in your ear canals naturally for a tight, secure fit even during extended use. It adopts the new Bluetooth 5.0 module to make it future-proof, and is already available in the market.